The Fidas® Frog is the smallest aerosol monitor in the Fidas family that utilizes the ultra-light real-time dust monitor made by Palas®. 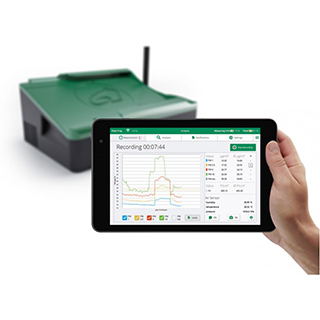 By integrating a removable tablet for remote control, data logging, and report generation, the Fidas® Frog provides the user everything necessary for field ready, portable measurements and investigations. The Fidas® Frog is an Optical Particle Spectrometer (OPS) that simultaneously measures PM1, PM2.5, PM4, PM10, and Total Suspended Particulate (TSP) as well as the Particle Number Concentration and the Particle Size Distribution with extremely high temporal resolution of up to a measurement every second. The Fidas® Frog introduces a new User Interface that makes for a more intuitive user experience for both experienced as well as new Fidas® users. The removable tablet can also be used to take pictures for site record management and remote reporting. It measures the particle number and particle size distribution in up to 64 size classes within the particle size range of 0.18 – 18 μm or 0.4 – 40 μm. The time resolution can be adjusted from one second to hours for continuous measurements. The removable tablet allows for additional storage capabilities in the form of removable Micro-SD Cards to compliment the 16 GB found on the tablet. The firmware supports complete remote access with remote maintenance and network support. Particle measurements: roadsides, quarries, coal tips, lignite opencast mining, etc.